It's half a mile north of Vauxhall to the Lambeth Bridge in central London. The demand for a bridge at this location diminished after Westminster Bridge was built. However, Westminster's capacity was eventually exceeded and the first Lambeth Bridge (a suspension structure) was built in 1862. Although it was originally able to carry 800 tons, it slowly deteriorated and was closed to vehicles by the beginning of World War I. 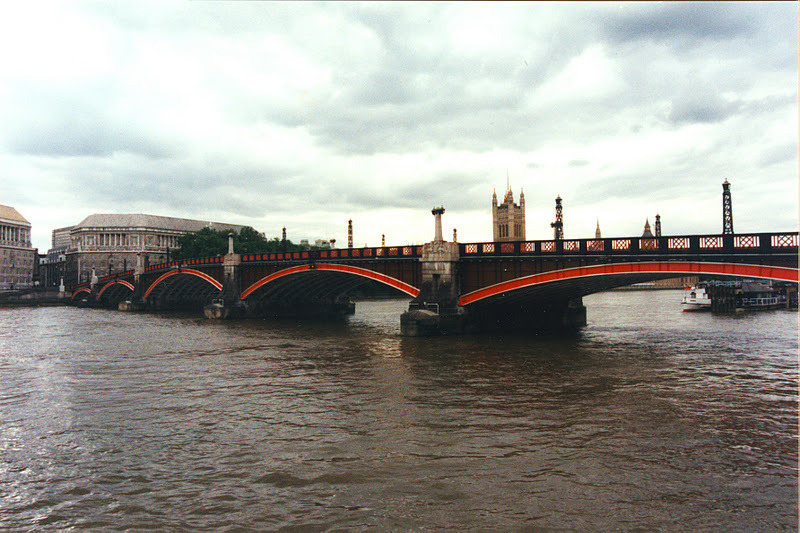 The current Lambeth Bridge (a five span steel deck arch) was designed by George Humphreys in 1929 and completed in 1932. It was painted red to match the color of the benches on the nearby House of Lords. However, this was the first bridge built by the London County Council, representing a new, more democratic London. Thames River Bridges: Lambeth Bridge by Mark Yashinsky is licensed under a Creative Commons Attribution-NonCommercial-ShareAlike 3.0 United States License.